My first visit to Greece was back in 1985 when I was 16. Though Athens, like all cities, was modern and telephones in the home were a given, my mum’s mountain village was still isolated. My sister and I were visiting with our grandmother, who was blind and mostly housebound, when we heard a PA like announcement coming over a megaphone “Can Vaia and Vassiliki, the Papadima girls, come to the cafenion to receive a phone call from your mother in Australia”. This megaphone kept going until we emerged from my uncle’s house. We took our grandmother with us. We had just been summoned to one of two phones in the village. As we walked to the cafenion all the villagers slowly emerged from the homes and followed us, curious to hear what was to be said. International phone calls were rare indeed and there is no word in Greek that means privacy. The phone line was crackling, we needed to shout down the receiver, my grandmother cried upon hearing my mum’s voice and the whole village was privy to our answers. By 1994, the whole village was connected to their phones and by 2010, due to an EU grant to encourage youth to not leave for larger towns, the whole village has wireless access. In the space of 25 years much had changed in the way isolated villages communicated with the world. They were no longer all that isolated. Youth no longer clamber to escape. My aunt, who lives on an island, has wifi access in her holiday apartments for her clients so as a present I bought her a small tablet so she can Skype with my mum and other relatives. My aunt was quite happy to learn how to use this new technology – though my mum is deeply upset. She does not want to see how her family has aged. She wants to use the phone only so she can keep them young in her mind. However my aunt likes it and Skypes my mum regularly. My aunt’s wifi was fab for me. It allowed me to work from her home and it allowed me to chat daily with my husband and my youngest son (who sadly could not travel with us). I donnot think that I would have ever endeavoured to have a 6 week trip away from half of my family if I was not assured of daily contact with them. In 1993, my sister, a friend and I travelled to Los Angeles. We arrived on the day of the Venice Beach riots. It was a tense place so we walked to a travel agent, and on a whim booked flights to Mexico City and bought a Mexico Lonely Planet. We always knew we were going to spend some time in Mexico because we had all our immunisations done but the plan had not been for the whole 3 weeks (and how funny that we perceived Mexico as safer than LA). I remember calling my parents perhaps once a week and sending a couple of postcards a week to let them know where we were. I think back to our travels backpacking across the south of Mexico and marvel that we had not organised anything. We had our guidebook and 3 weeks to get back for our flight to Sydney. I think that once my own kids get travelling, I doubt that they will travel with minimal contact over 3 weeks. I am grateful for this change. I am a worrywart and I will welcome their social media updates of any kind. This is not a bad thing. Where is my greeting party? Both in 1994 and in 1996, I was fortunate enough to be able to go island hopping throughout Greece, so with my latest visit I relished showing the island hopping ropes to my son. However, island hopping has changed. There is now quite a different island hopping thang going on. Not necessarily a bad thang, just different and this is in part due to technological advances. In 1994, the most technology my travel had was my walkman with a mixed tape (no – My Friend the Chocolate Cake and Barry Manilow are not mutually exclusive). Back then, I was able to work out the exchange rate in my head quite swiftly so I didn’t even need a calculator. This time, I travelled with a smart phone (which only functioned as a camera – I had no phone access for 6 weeks), a tablet and a laptop. I no longer automatically exchanged currency in my head but I could record my ideas much more swiftly. I travelled with no music, dependent only on the music provided on the plane and through wifi app choices. In 1994, tickets and accomodation on the Greek islands were incredibly random. Other than a well marked Lonely Planet guide, impulse decisions ruled. You made snap decions, you chanced tickets at the port, once you arrived at your destination there was accomodation spruiking chaos. Owners of pensiones, studios and hotels were all gathered at the port shouting their tariffs and availability. Through this random method I scored both brilliant and dodgy lodgings. Now, the ports are calm, less chaotic. Most people book their own accommodation through a variety of eservices like Booking.com, lastminute.com or just the rooms that advertise on their own island’s webpage. Chancing your accomodation just seems so BI (Before Internet). I feel a sadness at this. The chaos that ensued upon your ferry arriving at an island port also felt like a greeting party. So many locals thrilled at your arrival, greeting, waving, shouting, trying to get your attention. Arrivals this time felt devoid of joy, devoid of the sense of welcome. 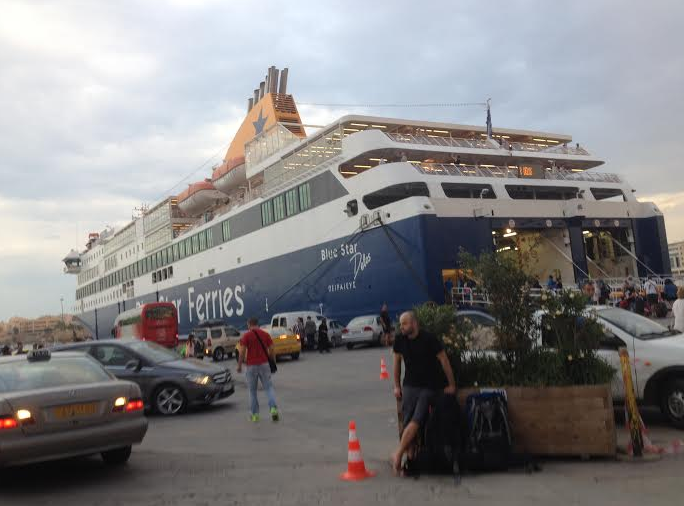 A queue of taxis and delivery vans are the only quiet observers greeting a summer ferry docking into port. person. I will talk to anyone. I had great conversations while we were in Greece and England with taxi drivers, shop keepers, fruit stall owners and the like. But tourists and travellers now seem averse at striking up conversation. No longer are they open to the “Where are you from?” smile. There is no eye contact at all. Perhaps I am feeling old and bitter, harking back to the “good ol’ days” but there doesn’t seem to be a willingness from other travellers to meet one another. I recall travelling between Santorini and Mykonos in 1996 and meeting 2 couples. The first were really funny Canadian Jehovah Witnesses “Chill out man, we only door knock on Saturdays, today is Tuesday” whom we travelled with for an extra 4 days. We also met an older American couple who seemed intent on showing us their nifty travel clothes with handy zippers converting trousers to shorts and skirts to dresses. I caught 10 ferries in total while I was overseas this year. I have sat next to so many people and tried to start a conversation but they all seemed much more intent in taking selfies and playing on their devices. I became the too-keen weirdo trying to strike up a conversation where previously my behaviour was the norm. I was saddened by this lack of wanting to meet new people. All the travellers seemed so intent on documenting their trips that they had no interest in the people that they were sitting alongside. I took to chatting with people who were travelling without luggage. They were the commuters who don’t seem to mind a change in their routine – the railway worker who commutes for 2 hours a day from the Isle of Wight to the Midlands to drive a train up to Liverpool and back. His 4 hour commute is bookended by beauty and a quiet place of his own away from traffic to the Santorini local who cannot afford to fly home in summer due to seasonal prices so takes the slow ferry from Athens twice a week. Island hopping has been further curtailed since Greece entered the EU and particularly with service cuts due to the financial crisis. Ferry tickets are exhorbitantly priced and impulse travelling seems much harder. I realise that I am also making these observations while I am in my mid-40s. Perhaps travellers in their 20s are still hopping on and off ferries, talking with new people and making impulse decisions and I just didn’t meet them. Plane travel is a whole different story for me. I pity the passengers that get seated next to me on a flight. They end up holding hands with a slightly crazed, definitely phobic me. I have held hands with 2 Greek Marias, a New Zealander called Jo, air stewards aplenty and a Reiki master. Though even I edged away from the Spanish bag lady who wanted to hypnotise me. Funny thing is that after such intense hand holding, none asked to be my Facebook friend. The information age has brought about a lot of changes in travelling. Communication is much easier, it is a relief for parents and friends who stay at home. For the traveller there is a sense of security, an ability to document every moment as it happens but also a sense of big brother, never really being able to escape from the constant need to check in, report back or to lose yourself or reinvent yourself away from the people who have known you for a long time. I’m not sure which of the two travel styles I prefer. There was much more freedom and friendliness in the 1990s. Travel seems much more controlled and organised in the 2010s. I went all out 1990s by not having a functioning phone but also experimented and for the first time ever I did not use a travel guidebook. I found that in all the orderliness, this allowed for a little bit of chaos. This gave me an unexpected freedom in experiencing places using only locally written information to advise me rather than using the perspective of a travel writer. Locally sourced guides felt much more genuine, less paraphrased and infinitely more informed. I like the orderliness of 2014 travel. Though the random, chaotic shouting was fun, and the sleeping on decks of ferry boats made us look homeless (an accusation I often overhead from the cabin paying passengers as they walked over my feet), the fact that I know I am holding a ticket, I have a secure booking and the fact that I won’t be turned away and forced to sleep in a train station or in a hostel mixed dorm while huddling my valuables in my sleeping bag while a tripped out Norwegian shines his torch into imagined corners around the room, makes me happy. But maybe that is more a sign of me being in my mid 40s and less a sign of liking the convenience of information technology. What a great, summative post! I loved reading it. It brought back some early Greek village memories. The first time I was in Greece was in 1970, during the colonels’ rule, even though my parents didn’t want to return while they were in power, family stuff necessitated a visit. (Actually, my dad stayed home: his politics would not have allowed him an, ahem, safe visit). I remember so vividly the “honi” that would announce the phone call in my mother’s village. In Athens, conversations were whispered, but an uncle in special forces grimly took us to a few places. The next time I was there was the summer the junta collapsed, 1974, (which, being a romance reader, always reminds me of the final scene of THE THORN BIRDS, hey, Aussie connection). In the chaos that ensued, my mother and I were left without any communication with my dad, all transportation impounded by the weak and disorganized Greek Army, trying to respond, at least defensively, to the threat from Turkey, after its invasion of Cyprus. Wow. All this to say, that travel ain’t what it used to be, absolutely. Greece is a way different country; we are way different and travel no longer has its roots in the word itself. Travail, travailler in French, which in Latin has its meaning in “torture,” or at the very least a long and difficult task, WORK. Labour. I too have never been a good traveller, preferring my travel, like my romance, from an armchair. It’s surprising, therefore, that I did my grad work in English on travel literature, which had its heyday in the period between the two world wars and roots in the Victorian Age, at least in English. The accounts I read were of travail over ease, chaos over order and advance bookings. They were also all men and there’s a particular vulnerability to travelling as a woman that I, at the time, did not realize or take into account (hey hey pun). Nevertheless, one thing about some of these harrowing travels that I noted was the utter aloneness in the face of utter alieness of people and places, of the narrator making travel as much a confrontation with the self, with the other (I read your attempts to converse with morbid fascination) and mortality as it was about place. The accounts are existential as much as they are the poetry of place. They are NOT travel guides. I’m not sure that what we’ve gained is worth what we’ve lost. As for Greece, what they’ve lost is pretty palpable. and for the most harrowing travel account, with a great voice, I’ve ever read, Graham Greene’s Journey Without Maps, Liberia, 1935. Sorry. All white. All male. All good. I think the differentiation needs to be made between travellers and tourists. Being a traveller is difficult even if you choose the road well travelled. I don’t think a traveller is better than a tourist, they just have different purposes for being in the same place. The difficulty of travelling is even recognised by the orthodox church edict on those who are exempt from fasting before communion being “the ill and the travellers”. The junta in Greece made such a huge difference to the way Greeks live and behave. There is a noticeable difference between Greeks that migrated before the junta and those that migrated during and after the junta. I love Patrick Leigh Fermour. His book Roumeli was the first time I read anyone’s account of the mountains of Greece. Up until then all the books I had come across were focussed on island life. I came across some of Miller and Durrell’s writing when I was researching Poros a couple of months ago. 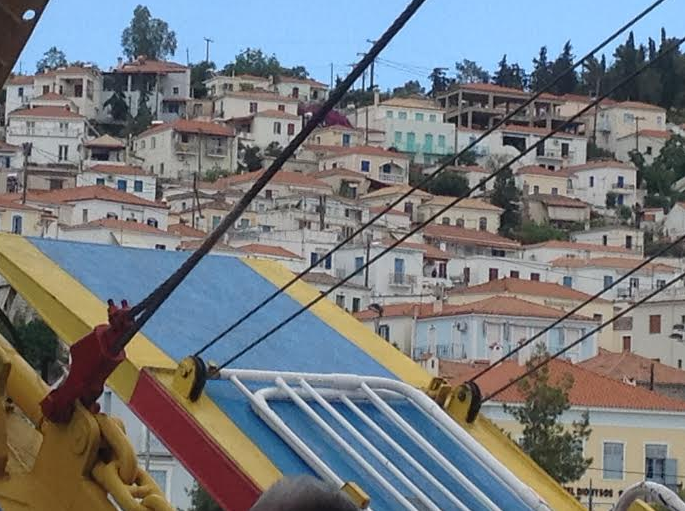 Their descriptions of Poros retain beauty and relevance, as the sea and mountain and light remain untouched by time with only some windfarms on the mountain ridges differentiating the current visual. As an aside, I don’t think we should apologise for reading and recommending white men’s writing. There are many wonderful, insightful white men that have been published over centuries. Thgat we need to continue the changes that society demands in representing women and have multicultural voices in literature and media and having a broader perspective is important but I think it is important to understand white men’s writing in the era that they were pubished. I sort of miss the mega phone announcements, but you do still get them in Sicily, although the distortion makes it difficult to know what is being said. You still get megaphone announcements in Greece, not only in villages but in Athens. They are for scrap metal, old chairs or watermelon sales.